Animal Zone International offers sincere condolences to the family of Michael Kovaios upon his death. Michael Kovaios served for many years in the local government as President of the former community of Katapola, as Mayor of Amorgos, as a Municipal Councilor and as a member and Secretary of the Board of Directors of the Municipal Port Fund of Naxos. He was an active person with a strong personality and his contribution to our island was great. He was always beside us when we needed him, helping us out as he could. Have a nice journey Michalis; we will always remember you. Our warmest condolences to his family. 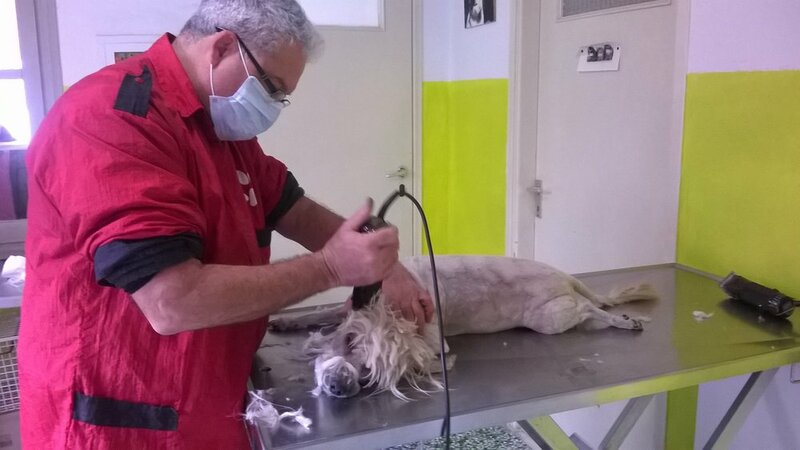 Veterinarian Dr. Dimitris Vassalakis visited Amorgos and worked at AZI's Center this past weekend. He examined all the cats and dogs that are under AZI's care as well as animals that were brought by neighbors and other members of the community. These vet visits are a vital and major part of AZI's mission to provide healthcare to the animals on Amorgos, as there is no permanent veterinarian on the island. We write from the island of Amorgos to tell you of six year old Emilio, a young island resident who suffers from leukemia and is in need of our help. Emilio Soulejmani was diagnosed with leukemia in August of 2017 and has been transferred to Athens in order to undergo therapy. He is hospitalized at the "Marianna V. Vardinoyiannis-ELPIDA" Children's Oncology Unit where his parents and his brother are able to stay beside him. The expenses for his family are great and the Association of Parents and Guardians of Aegiali – Thollaria is collecting donations for his care. We stand beside this island family and wish them all the very best for a healthy and loving future. Our vaccination program took place earlier this month, over the weekend of July 9th and 10th. It was completed successfully in spite of challenging conditions. The cats tend to hide away in the summer heat and we were only able to find them early in the mornings and late in the afternoons, but even with these difficulties over one hundred and seventy stray cats from the area of Aegiali have now been vaccinated for panleukopenia, calicivirus, rhinotracheitis and chlamydia as well as having been given pills for worming. Many of the residents of the island have told us that there are still a large number of cats that hid so successfully we could not find them and it is our belief that from now on we should try to conduct our programs before the summer weather grows too intense. We are happy to say that many of our island cats are now protected from the danger of viruses and we hope to inoculate the rest of their tribe when the weather cools down. While we were out on the streets and in restaurants and hotels, many people seemed interested in learning about our work here in Amorgos and the island’s residents as well as the tourists who come to this beautiful island have therefore become much more concerned about the health and safety of the island animals. 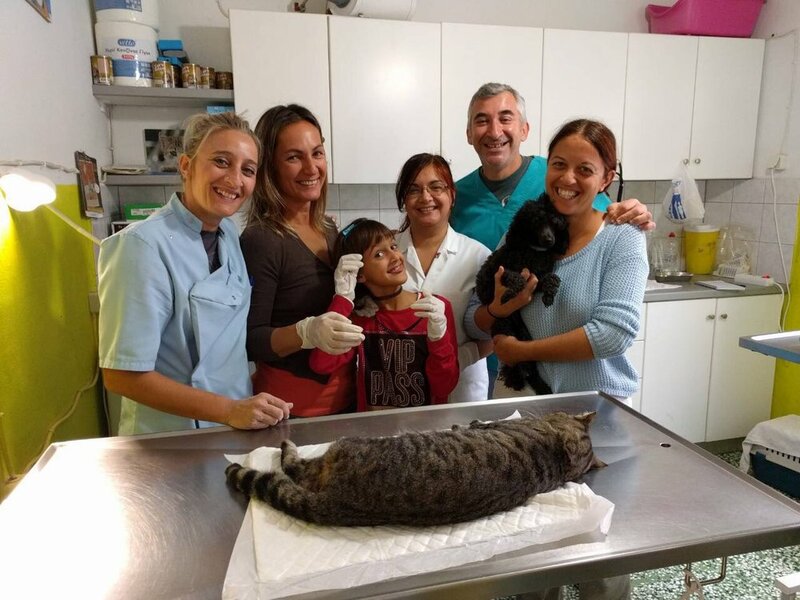 Dr. Dimitris Vasalakis vaccinates one of the stray cats that Mrs Tasia cares for in Ano Potamos. Our volunteer in Aegiali, Lily Clevede, Dr. Dimitris Vasalakis, our volunteer from WorkAway, Giorgos Zafiriou and AZI Coordinator Litsa trying to catch the cats in Langada in order to vaccinate them and give them pills against worms. Dr. Vasalakis examines one of the stray cats that our volunteer, Lily Clevede, takes care of near her home. 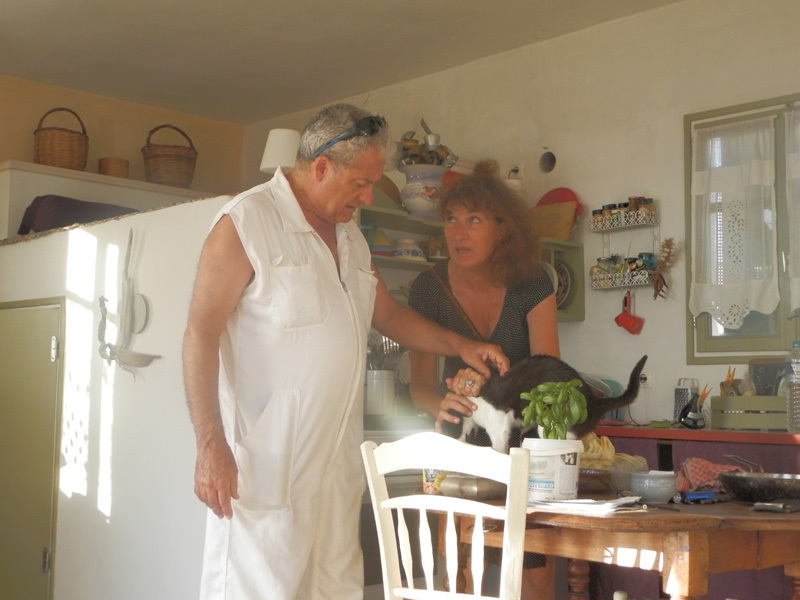 Our volunteer in Aegiali, Giorgos Kantarakias, Dr. Dimitris Vasalakis and Lily Clevede with a cat in Tholaria. Lily with Dr. Vasalakis vaccinating one of the cats of Lakki Hotel. Lily, with Dr. Vasalakis, vaccinating one of the cats of Nisi Restaurant. Dr. Dimitris Vassalakis, our oldest supporter and advisor, came to Amorgos from Naxos and worked nonstop at our clinic. 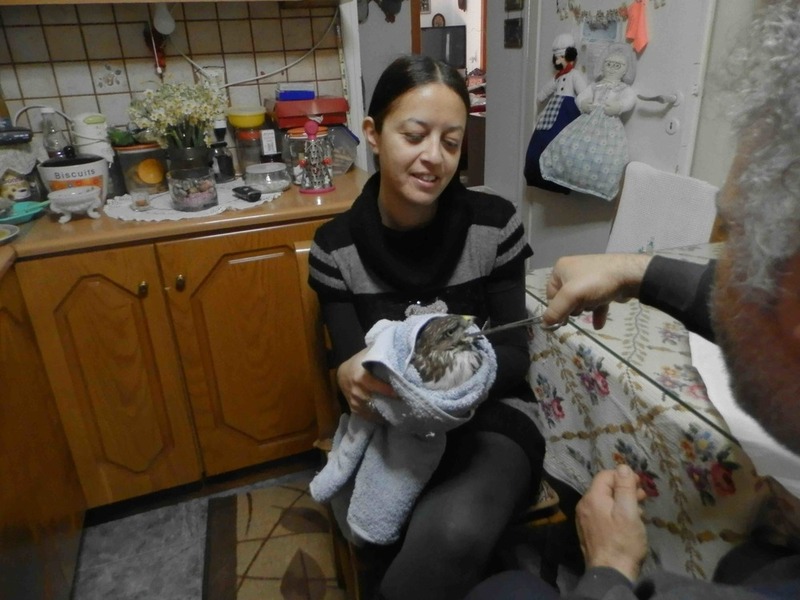 In February, a common buzzard was rescued from a hencoop in Ormos on Aegiali. The bird remained with us for ten days, at which point it was examined by Dr. Vassalakis and was discovered to have a wing fracture that had not been obvious at the beginning of its stay. We decided to send the bird to the Rescue Center for Wild Birds, “Alkioni,” in Paros, and by March it had come back to Amorgos healthy and strong and ready to return to its natural habitat. During its stay at “Alkioni,” our own bird was examined and treated along with a second common buzzard that had been rescued and sent to Paros. Both birds were treated successfully and were released back into the area of Aegliali. We want to thank the local volunteer, Jennie Arvaniti, who rescued and sent our bird to us. We also want to thank another volunteer and member of the local animal welfare society, “Panagiotis Pshogios,” who helped to care for the bird while at the same time sharing with us his extensive knowledge of wild birds. As well, we would like to thank the Aegean Wildlife Hospital, “Alkioni”——who took care of the two birds as well as for their excellent cooperation during these many years. Finally, we would like to thank Dimitris Synodinos (Amorgos Diving Center) who was the rescuer of the second bird and was able to release both of them back into nature.